Garber (far right) with (from left to right) team mentor Jason Goldberg and Hazel Tech's Adam Preslar, Yuvi Kundasi, Aidan Mouat, and Pat Flynn. 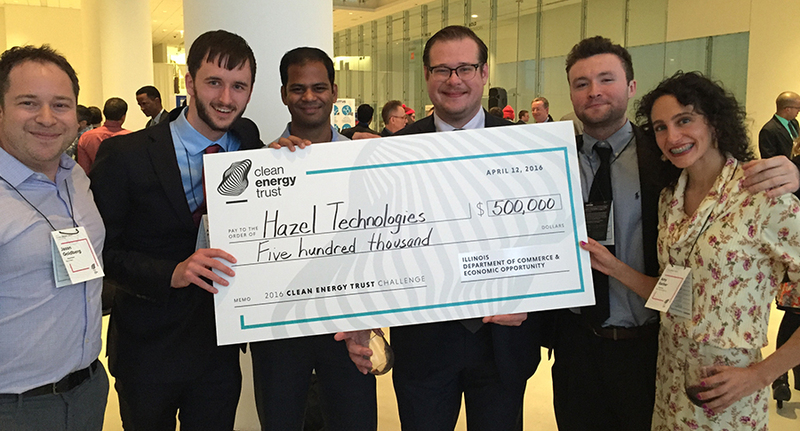 Hazel Technologies developed FruitBrite, a capsule that delivers EPA-approved ethylene inhibitors that slow the aging process in some plants. The product is designed to reduce produce spoilage and thus reduce food waste. The company is dedicated to addressing the problem of food waste in a sustainable manner, and is currently raising money to fund pilot programs across the food supply chain. "With the award, we can continue our efforts toward creating a more sustainable food supply chain, where agricultural losses are minimized. We will be able to transition from our product development and optimization phase to production on a commercial scale. We plan to move into a larger space and purchase some additional equipment for that purpose,” said Garber. “With regard to my area of expertise, this award will make it possible for us to execute our international IP strategy as food waste is a global issue that Hazel Tech intends to tackle. We are thrilled to be recognized by the Clean Energy Trust, and we look forward to making a positive impact on the environment with the help of their continued mentorship and generous award." The company has also earned startup funds from the Northwestern University Venture Challenge competition, the Institute for Sustainable Energy at Northwestern, and VentureWell, a nonprofit organization that supports technology entrepreneurship. They also received a USDA Phase I Small Business Innovation Research Program grant.